Wow, it has been a while since I last blogged! What better way to get back into the swing of things than with a pass on the VMware 2V0-622D exam. My VCP6-DCV was coming round for renewal and as usual, a mad rush to recertify. 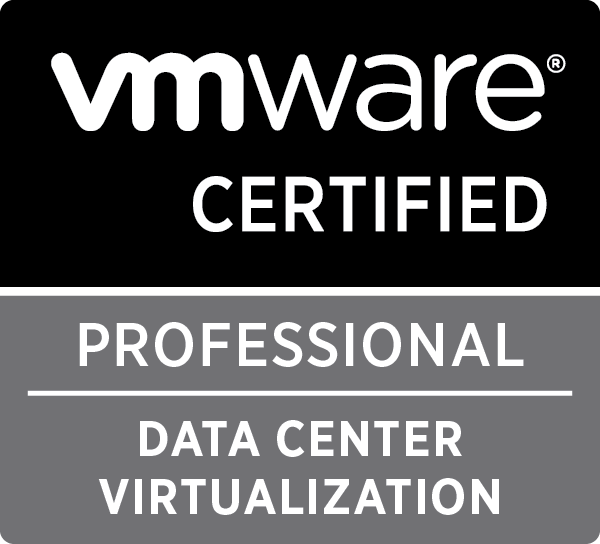 Days just before the exam was scheduled, this happened: ‘VMware Certification: Recertification Is Changing and What It Means to You’ Essentially, allowing you to recertify when is convenient for you. With most of the hard work already put in, it made sense to press ahead with taking the exam. The question now remains, do I renew in the future… watch this space! For those that are not aware, the 2V0-622D is the delta exam, this delta exam focuses more on the upgraded content between VCP6 and VCP6.5. My VCP5-DCV certification was due to expire at the beginning of March 2017. In order to retain the VCP status, VMware requires that you recertify every two years. The reasoning for me to take the VCP6-DCV was due to work commitments and to keep on top of my current skill set. The resources I used, have been similar to what I have used before. I took the vSphere 6 course with 360GSP – Dai, their trainer is excellent and knows the subject inside out, I would highly recommend, especially if a weekend course is more suitable!. Read my review here of the vSphere 6 course with 360GSP. I took the exam at Nexgenn Consulting Limited, as it was close to where I work. What I was really intrigued by is how thorough they were in ensuring you are not carrying any materials, they asked for all pockets to be pulled out, sleeves rolled up, asked me to pat my trousers down! I’m surprised by what lengths people will go to! The exam centre also provide lockers to store your personal belongs. More than happy to use this test centre again, being close to work is a big convenience. I decided to go for the full exam (2V0-621) rather than the delta, main reasoning being is that I had a voucher to use, otherwise I would have taken the delta path. I’m glad to report I passed the VCP6-DCV exam, further renewing my VCP status for another two years. What’s next? At the moment my focus is completing my degree with the Open University, which finishes around September and then I shall decide on what path next! Microsoft are currently offering a second shot to resit any MCP exam taken between July 12 2015 and January 12, 2016 if you don’t pass on your first attempt. You must reschedule your free retake within 30 days of failing your MCP exam. Might be encouraging for those thinking of going for the MCSA or MCSE! As mentioned in a previous blog post, I managed to pass the VCP5-DV exam (second attempt) and thought I would give a list of the resources I used. Its worth noting before becoming VCP5-DV certified you need to attend a course, see here for my review on the course I did via the 360gsp college. The most important place to start studying is checking out the VMware VCP5-DV Exam Blue Print. Be expected to know everything on the blueprint. You get 85 questions with a time limit of 90 minutes for the exam. When looking at articles/documentation I tend to clip them to Evernote and tag them so I can reference them later. I use Google Chrome with an Evernote plugin to achieve this. YouTube has some good videos. The VMware forums are worth contributing to whilst studying and afterwards. Whilst I didn’t use the AutoLab, it seems like a great resource. The AutoLab pre-configures a vSphere5 environment. Once you have completed the VMware course, VMware have a mock exam via the VMware learn portal. I would recommend AnkiDroid as a flashcard app for Android, you can download a VCP5 pack which includes maximums and some practise questions, you can also create your own flashcards. Very useful on the go. I have been using this method of flashcards since my ICND1 stuides. There are other flashcard packs for CCNA etc. Google google google! I found googling topics/errors/etc brought me to loads of VMware blogs, reading articles after articles helped with learning and also the real word stuff. Most of the people that have blogs are on twitter, I would highly recommend getting into Twitter and following bloggers, its a great way to keep an eye on whats happening quickly. I use Tweetdeck and have multiple lists and columns for bloggers – it’s just a fantastic way to easily filter out the noise on twitter. So whats next for me? Well, I was studying towards the Cisco ICND2 for the CCNA before I saw the excellent offer by 360gsp college so snapped that up. I shall now continue with my Cisco ICND2 studies and when I have time get more familiar with the vSphere 5 PowerCLI.